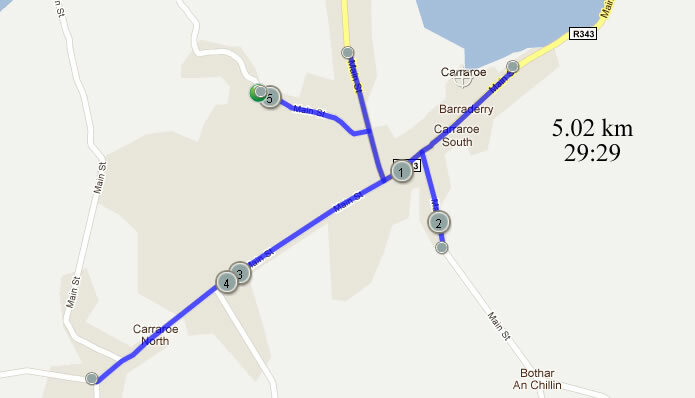 I figured sitting around and abandoning all my good eating habits the last few days were going to catch up with me, so I got out last night and just knocked out a few kilometres around Carraroe. It was a serious effort to get off the couch but I'm glad I did now as it really did me the world of good. Despite the fact it was a cold windy evening, when I got started the cold eventually disappeared as I took off around Carraroe, feeling a bit rough to be quite honest. The legs felt heavy but soon enough I was forgetting about that and just knocked the run out, feeling great after it. Ah it's good to get back into it again.